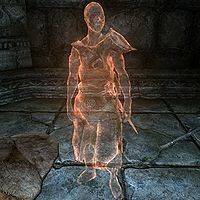 Drennen is the ghost of a Nord warrior who met his death in Avanchnzel. He now wanders the halls of his tomb with his similarly ghostly companions Breya, Watches-The-Roots, and From-Deepest-Fathoms. His corpse can be found in Avanchnzel Animoncultory in a sloping corridor after the factory-like room. On his body is his studded armor and a pair of hide boots, as well as an iron sword and a selection of common items and gold. This page was last modified on 14 July 2014, at 02:53.